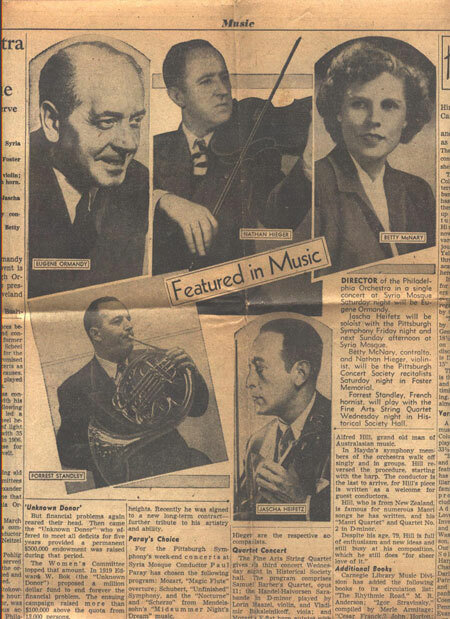 In this unidentified Pittsburgh newspaper clip, my father finds himself in very good company, on the same page between Eugene Ormandy, conductor of the Philadelphia Symphony Orchestra, and contralto Mary McNary. Directly beneath him and to the right is Jascha Heifetz. My father and Ms. McNary were the featured Pittsburgh Concert Society recitalists at the Foster Memorial.